“We were working out a slip table, and we had not quite finished when she went down. All of us were on, working out a slip table, how many turns of the engine it would require to do so many knots; and all this, and it tapered down.” - Titanic's 5th Officer Harold Godfrey Lowe. The SS Olympic and SS Titanic were triple-screw steamships propelled by two reciprocating engines and a low-pressure Parsons’ turbine engine. Each reciprocating engine drove a wing propeller while the turbine engine drove a central propeller. The two wing propellers on these ships had 3 manganese bronze blades fastened to a cast steel boss by high strength studs and nuts. This allowed for changes to the pitch of the blades without having to replace the entire assembly. The wing propellers had a diameter of 23 feet 6 inches, and surface area of 160 square feet. On Olympic the original pitch of these propellers was set to 33 feet in 1911. The pitch was later increased to 34 feet 6 inches in early 1912. On Titanic the pitch of her wing propellers was set to 35 feet 0 inches. The central propeller on these ships was of solid construction and cast of manganese bronze. On Olympic the center propeller had 4 blades, and was 16 feet 6 inches in diameter with a surface area of 120 square feet. On Titanic the central propeller had 3 blades, and was 17 feet 0 inches in diameter with a surface area of 120 square feet. 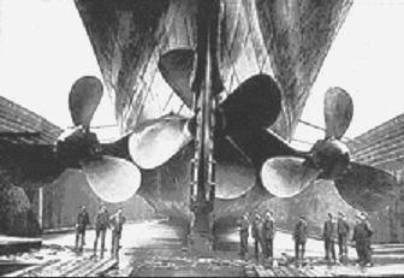 The differences between Titanic’s propellers compared to Olympic’s was probably done in an attempt to reduce the power loading per disk area to improve overall efficiency. Looking forward from a point behind the ship as she was going ahead, the port-side wing propeller would be rotating counter-clockwise while the central propeller and the starboard-side wing propeller would be rotating clockwise. This can be seen below in the animation for Olympic. Three engine-order and reply telegraphs, supplied by Messrs. J. W. Ray and Co., Liverpool, communicated engine orders from the navigating bridge to the engine room. These telegraphs were double-faced drum instruments mounted on pedestals. Each instrument had clear glass dials measuring 20 inches in diameter that indicated eleven different orders. The port-side dial on each instrument indicated orders for the port engine, and the starboard-side dial on each instrument indicated orders for the starboard engine. Two of these telegraph instruments, the two main engine-order telegraphs, were located on the far port and starboard sides of the navigating bridge. They were linked to each other in such a way that either the unit mounted on the port side, or the unit mounted on the starboard, could be used to send orders down to the engine room to control both engines. As they both indicated the same orders all the time, it just depended on which of the two telegraph units happened to be more convenient to use at a given time by the officer in charge on the bridge. The linkage from the main engine-order telegraphs on the bridge was connected to two 24-inch telegraph indicators down in the engine room, one for the port engine and the other for the starboard engine. These indicators were located about 12 feet apart on the forward low-pressure cylinder columns of the reciprocating engines by the starting platform. The third engine-order instrument on the bridge, the emergency engine-order telegraph, was connected to two other engine-room indicators through an entirely different route thereby forming an entirely separate emergency control should the linkage from the main engine-order telegraphs be damaged. Eleven different orders for each engine could be sent down on these telegraphs as indicated in the table below. 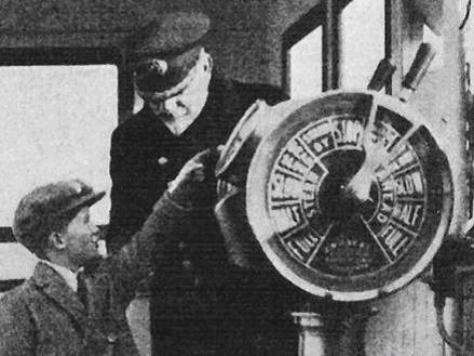 An engine-order telegraph built by Messrs. J. W. Ray and Company with the arrangement used on the Olympic and Titanic can be seen in the photograph below taken on the port side of the bridge with what appears to be a ship's captain explaining it all to a young lad. Notice that both handles are in the forward “Stand By” position which is telling the engineers down in the engine room to have both reciprocating engines ready to be moved ahead shortly. From testimony given by Olympic’s Chief Engineer Robert Fleming following the Hawke incident in 1911, we are told that the turbine engine was connected up only when they called for “Ahead Half” or “Ahead Full” on both reciprocating engines. An order for “Ahead Half” corresponded to 50 revolutions per minute on the reciprocating engines. The turbine engine was always bypassed when going astern or when maneuvering engines while going ahead. What Do We Know About Speed, Revolutions, and Engine Orders? From trial data of the Olympic presented by Harland & Wolff’s naval architect Edward Wilding at the British Inquiry into the loss of the Titanic, we know that the Olympic made 18 knots at 60 revolutions per minute (BI 25295), and 21½ knots at 74 revolutions per minute (BI 25292). In Duncan Haws’ book on White Star Line ships, we get another data point for the Olympic, 22.82 knots at 79 revolutions per minute. There was also data presented on day 16 at the British Inquiry that 75 revolutions per minute would give between 21¾ and 22 knots (BI 18372), data that was confirmed by J. Bruce Ismay, managing director of the White Star Line. We also know from Edward Wilding that the maximum speed expected from the Titanic with all 29 boilers connected up was about 23¼ knots (BI 25292). In this equation, V is taken as the speed of the ship through the water in knots, R is the number of revolutions per minute carried on the reciprocating engines, q is an exponent to be determined, and K is a constant also to be determined. We can solve for q by taking the ratio of Wilding’s numbers for 60 and 74 rpm in the above equation. The result is a value of q = 0.8472. We can also use the value of R=79 and V=22.82 from Duncan Haws to solve for K. The result is K = 0.563. The turbine engine ran at a rate of about 2.22 times that of the reciprocating engines. According to Olympic’s Senior Second Engineer John Thearle, the turbine would make between 175 and 180 rpm when the reciprocating engines were making 80 rpm, and the maximum number of revolutions on the turbine would be about 190 rpm when the reciprocating engines ran at their highest possible speed. The following diagram shows the relationship between the number of revolutions on the turbine engine to the number of revolutions on the reciprocating engines based on the above. After the Hawke collision in 1911, Captain Smith, Commander of the Olympic at that time, was asked, “When you are working at reduced full speed, [i.e., inside coastal waters] what do you make then?” Smith replied: “[Reduced] Full speed [is] about 20 [knots], about 75 revolutions, and Half speed 50 [revolutions] would be about 15 [knots], Slow 30 [revolutions] would be 8 to 9 knots.” He describes these as “easy steam, coming in and out of port.” It is very likely that he either downplayed the speed at 75 revolutions, or more likely, was thinking about 75 revolutions for open waters when he talked about full ahead speed. There was evidence that Olympic’s engines were doing only 65 rpm at the time of the Hawke collision – making perhaps 19 to 20 knots through the water. This didn’t suit anyone who wanted to say it was Hawke that was going too fast. It is obvious that 20 knots is about two knots too low an estimate for 75 rpm, something which can be checked simply by referring to the data supplied by Wilding. It is interesting that Captain Smith would have even been thinking of 75 revolutions for reduced full speed ahead since we know that even in coastal waters they ran much lower than that. For example, the Titanic ran up to only 68 revolutions in her cross-channel journey from Southampton to Cherboug, and then only 70 revolutions from Cherboug to Queenstown, and again 70 from Queenstown to Fastnet light. The speed we derived for the Olympic for Ahead Half at 50 rpm with the turbine engage (15.5 knots), and the speed we just derived for Ahead Slow at 30 rpm with the turbine disengaged (8.7 knots), are in good agreement with what Captain Smith mentioned for those speeds as related above. The speed for Dead Slow Ahead that was derived (6.2 knots) came about by using a value of 20 rpm with the turbine disengaged. The information on minimum revolutions for this order came from Olympic engineer Charles McKimm. It also seems very unlikely that the reciprocating engines would be run at anything much less than 20 rpm which is one revolution every 3 seconds. Making about 6 knots through the water, the ship would easily continue to make steerageway. A plot of speed Vs. rpm for when the turbine was disengaged is shown below. This would be applicable for revolutions less than 50 per minute on the reciprocating engines. Propeller Pitch is the distance that a propeller would move in one revolution if it were moving through a soft solid medium not allowing for any slip. It is the ideal travel distance for one revolution of the propeller. Propeller Slip is the difference between the ideal travel distance and the actual travel distance in one revolution of the propeller. Angle-of-attack is the angle between the chord of the propeller blade and a line representing the relative water flow across the blade. These relationships are seen in the diagrams below. The first diagram shows the difference between the ideal travel path of a propeller blade and the actual travel path of the blade for one revolution. The slip is the difference between the two paths as shown. The second diagram shows the pitch angle of a propeller blade, the relative direction of water flow across the blade, and the angle-of-attack between the propeller chord line and the water flow vector. It should be pointed out that there needs to be some positive angle-of-attack (as shown) in order for the propeller to develop positive thrust. If the angle-of-attack were zero, then the propeller blades would be cutting through the water without producing any thrust. If the angle-of-attack were negative (i.e., the water flow vector coming from above the chord line), then a negative thrust would develop and the propeller would tend to slow the ship down. From the first diagram we see that slip is nothing more than the difference between the ideal travel distance through the water in one revolution (the propeller’s pitch) and the actual travel distance through the water in one revolution. The percent of slip is obtained by divided the slip by the pitch and expressing the result as a percentage. The percentage of propeller slip can be calculated for a number of different speeds through the water. To do this we make use of the diagram shown below, the known dimensions of the propellers, and the number of propeller revolutions for a given speed which we have derived above. For Titanic’s wing propellers, the pitch is 35.0 feet per revolution, the diameter is 23.5 feet, the standard 7/10 radius travel is 51.7 feet for one revolution, and the propeller pitch angle at the 7/10 radius is 34.1°. At 75 rpm, the percent of apparent slip calculates out to 14.6%, and the apparent angle-of-attack, a, calculates out to 4.1°. We can derive the percentage of apparent propeller slip for Titanic’s wing propellers over a range of revolutions per minute by taking the speed through the water that we have derived as a function of the reciprocating engine revolutions and using the known pitch of the wing propellers. The results are shown in the table below. Notice that the apparent slip for the wing propellers jumps down significantly once the turbine engine is engaged at 50 rpm. This is because the central propeller is now carrying about 1/3 the total thrust load of the propulsion machinery thereby reducing the loading on the wing propellers. At the same time, the speed of the ship through the water increases as well. An increase in the velocity of the water takes place in the stream of water that approaches the disk area of a propeller because of the action of the propeller. As a point in the stream gets closer to the propeller its velocity will start to increase because of the lower pressure created by the movement of water through the disk area of the propeller and will further increase as it leaves the disk area going downstream. It is the acceleration of that water that results in the trust produced by the propeller. (For every action there is an equal an opposite reaction.) Under ideal conditions, the total velocity of the water relative to the ship cannot be greater than the pitch speed of the propeller which is attached to the ship, our frame of reference. For Titanic making 75 rpm on her wing propellers, the propeller pitch speed is 25.92 knots (the rotational speed [75 rpm] times the pitch of the prop [35 ft] converted to knots). This is also known as “knots by propeller.” The difference in speed between what the ship is actually making through the water and what the propeller should be making based on its pitch is what we have been calling the apparent slip speed, or in this case, 25.92 – 22.15 = 3.77 knots. This yeilds an apparent slip ratio of Sa = 3.77/25.92 = 0.146, or 14.6% for 75 rpm on Titanic. However, the apparent slip is not the true slip of the propellers. To get the true slip we must take into account the velocity of the ship’s wake which reduces the velocity of the water stream in the vicinity of a vessel’s stern. For a vessel making V knots through the water, the velocity of the water in the vicinity of the stern is given by (1-X) V, where X is the wake coefficient, a number that is a function of the ship’s block coefficient, Cb, a fullness factor. For twin-screw vessels, X = -0.2 + 0.55 Cb, and if we use that for Olympic and Titanic which had a Cb of 0.684, we get a value for X = 0.176, or a wake velocity in the direction of the ship’s motion of 3.9 knots when the ship is making 22.15 knots through the water. That means that the speed of water approaching the disk area of the propellers will actually be 18.25 knots, not 22.15 knots. The behavior of a propeller on a vessel is not all that different from that of a fixed pitch propeller on an airplane. The pitch of the propellers are chosen to give highest effciency at cruise speeds. Today they have variable pitch propellers for ocean going vessels, something not available in 1912. As I told you, sir, we were working at our slip table, and that is a table based upon so many revolutions of engines and so much per cent slip; and you work that out, and that gives you so many miles per hour. This table extended from the rate of 30 revolutions a minute to the rate of 85 and from a percentage of 10 to 40 per cent slip; that is, minus. We were working it all out, and of course it was not finished. The revolutions per minute that officer Lowe was referring to were those of the two reciprocating engines. However, in working out the table, the affect of the turbine being connected up for revolutions greater than 50 rpm would show up in the results. The purpose of working up such a table was to be able to estimate speed made good for a number of revolutions carried. This would be used to calculate the ship’s position using dead reckoning. Once this table was worked out it was to be kept in the chart room. Down in the engine room the Chief Engineer (Bell) was required to file a report to the Commander (Smith) every day shortly after noon that showed the estimated quantity of coal consumed since noon the previous day, the quantity of coal remaining, and the nautical miles run by revolutions of the engine since noon the previous day. This distance, also referred to as “Knots by Propeller,” was obtained by taking the average of the number of revolutions turned on both engines and multiplying that number by the propeller pitch and converting the result into nautical miles. On Titanic and Olympic it was the practice that the oncoming most junior officer at the beginning of each 4-hour watch would call down to the engine room to get the average number of revolutions per minute. The information would specify the average rpm made on each reciprocating engine, port and starboard, during the previous 4 hours. This was then written down by the junior officer, along with other navigational related data, into the ship’s log book. Based on celestial observations, the ship’s position would be accurately ascertained periodically. The distance run between two fixes divided by the time run between the fixes would give the speed made good over the sea bottom. The average number of revolutions per minute carried during that time along with the speed made good became data points in the slip table that Fifth Officer Lowe was talking about. The percent of slip would be obtained by taking the actual distance run and subtracting it from the ideal distance run based on the revolutions that were carried. This difference in distance is called the slip distance. The ideal distance used to get that result would be calculated by simply taking the number of revolutions that the engines turned over during the run time, multiply that number by the pitch of the propellers (in feet), and then converting the result to nautical miles (using 6080 feet per nautical miles). Once the slip distance is obtained, the percentage of slip would be given by dividing the slip distance by the ideal run distance and listing the result as a percentage. To illustrate what Lowe and the other junior officers were working on, let’s take an example. It was reported that from noon April 13 to noon April 14 the Titanic ran a distance of 546 nautical miles. It was also reported that the order was received down in the stokeholds on Saturday for them to be carrying 75 rpm. On Sunday a bulletin was posted at 3 p.m. down in the stokeholds stating that the they were making 77 rpm, and after 4 p.m. it was noted that they were making 76 rpm. This was all before additional boilers that were lit on Sunday morning were put on line at 7 p.m. that night. Charles McKimm, an Olympic engineer, had once stated, “as she gets way on, the revolutions come up all the time, there is nothing very stationary about revolutions.” Not only did the revolutions on these ships not remain stationary all the time, they did not always match on both reciprocating engines. For example, it was noted that when the Olympic was running at Full Ahead she may be carrying 80 rpm on the port engine while the starboard engine was making only 78 rpm. A slight imbalance between the two engine rpm values on the Titanic was also noted by Second Officer Charles Lightoller. So in working out a slip table it would be the average number of revolutions that is used in the calculations. If, for the purpose of this example, the average number of revolutions carried from noon April 13 to noon April 14 was 75.0 per minute, then the average number of revolutions turned by the engines over 24 hours and 45 minutes, the time from local apparent noon on April 13 to local apparent noon on April 14, would be 111,375 complete turns. Since the pitch of the wing propellers was 35.0 feet per revolution, the ideal distance traveled by the ship would have been 3,898,125 feet, or 641 nautical miles. But the actual distance run between noon April 13 and noon April 14 was noted as 546 nautical miles. Therefore, the percentage of slip would be (641-546)/641×100 = 14.8%. A slip table worked out from actual distances traveled over ground will be influenced by the average current encountered along the route. This is because when going against the average current set, encountering a head current, the value of slip will work out to be somewhat larger than the actual slip through the water. When going with the average current set, encountering a following current, the value of slip will work out to be somewhat less than the actual slip through the water. So there may be one table used for westbound crossings when generally traveling against the average current, and another table that would be used on eastbound crossings when generally traveling with the average current. The table below shows some average number of revolutions carried by the Titanic since leaving Southampton on April 10, 1912, bound for New York via Cherbourg and Queenstown up to the time of the collision with the iceberg. These come from various sources listed. The speed through the water shown comes from our speed table derived for revolutions greater than 50 rpm. The full speed of the ship is 78 revolutions. She works up to 80...It was our intention, if we had fine weather on Monday afternoon or Tuesday, to drive the ship at full speed. That, owing to the unfortunate catastrophe, never eventuated. 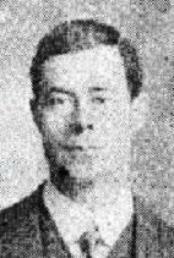 From the taffrail log reading taken by Quartermaster George Rowe at the time of the collision, the Titanic average 260 nautical miles through the water since noon Sunday, 14 April. This makes for an average speed through the water of 22.29 knots. Quartermaster Robert Hichens testified that the ship was advancing about 45 nautical miles every two hours by log - an average of about 22.5 knots through the water - all day that Sunday, and the quartermasters were even talking about it in their quarters. He last recorded the log reading at 10 PM. Both of these observations are consistent with the ship carrying an average of about 75-76 rpm up until the time of the collision at 11:40 PM 14 April. If they would have increased the revolutions further on Monday or Tuesday to an average of 80 rpm as Ismay hinted they were going to do, then an average speed through the water of about 23¼ knots might have been seen. And if they would press the engines to go up to 83 rpm, a maximum number that we have from Olympic’s Chief Engineer Robert Fleming, a speed of about 24 knots through the water would have likely resulted. Unfortunately, they never got the chance to really find out. I would like to thank Mark Chirnside for sharing with me detailed information from several of Olympic’s engineers, and access to several pages of the engine logs of the Aquitania that showed the various items recorded. Also thanks to Rebecca Lawrence for the picture of the engine-order telegraph taken on the bridge of a White Star Line vessel. In addition, I’d like to thank Captain Charles Weeks of the Maine Maritime Academy for his enlightening explanation of how slip is calculated for a ship at sea. The following are the complete speed tables derived for Olympic and Titanic for revolutions on the reciprocation engines from 50 rpm to 85 rpm with the turbine engaged. The revolutions on the turbine engine would be 2.22 times that of the reciprocating engines. The Shipbuilder, Vol. VI, Special Number, Midsummer 1911. From an entry in an original engineering notebook kept by Harland & Wolff prior to Olympic’s 1913 refit. Ref: Mark Chirnside, “The Mystery of Titanic’s Central Propeller,” ET Research paper, Monday, 5 May 2008. The Olympic had undergone later changes to her propellers in March 1913 which included: reducing the diameter of the reciprocating propellers from 23.5 feet to 22.75 feet, increasing their pitch from 34.5 feet to 36.0 feet, and increasing their surface area from 160 square-feet to 165 square-feet. She also had her central propeller changed from a 4 bladed propeller to a 3 bladed propeller with increased diameter from 16.5 feet to 17.0 feet, decreased pitch from 14.5 feet to 14.0 feet, increased surface area from 120 square-feet to 125 square-feet, and with changed material of boss and blades to turbadium. Mark Chirnside, “The Mystery of Titanic’s Central Propeller,” ET Research paper, Monday, 5 May 2008. There were two other telegraphs besides these three engine-order telegraphs that were mounted on the navigation bridge. These were the Maneuvering telegraph, and the Docking and Emergency Steering telegraph. Both were connected to two similar units located on the after bridge on the poop deck. It should be noted that the telegraphs installed on White Star Line vessels were arranged with two “Stand By” orders – one ahead off and one astern of the “Stop” order – instead of having a customary “Finished With Engines” order located aft of the “Stop” order. There were other differences as well. For example the engine telegraphs on the Adriatic had a “Close Watertight Doors” order in the aft most position, and had no “Dead Slow” astern order. On the Olympic and Titanic, watertight doors in the machinery spaces were close automatically from the bridge by throwing a separate electrical switch for just that purpose. Duncan Haws, Merchant Fleets - White Star Line (Oceanic Steam Navigation Company), TCL Publications, Pembroke, Dyfed, United Kingdom, 1990. At 75 rpm on her reciprocating engines, Olympic would run at 21.83 knots through the water based on our model. Using a factor of 1.0145 more, Titanic running at 75 rpm would make 22.15 knots through the water. This amounts to an increase of 0.32 knots over Olympic. We also have evidence that Titanic averaged 22.06 knots carrying 75 rpm on her reciprocating engines over a 24 hour 45 minute period between local apparent noon 13 April to local apparent noon 14 April on her maiden voyage running against the North Atlantic drift. Evidence presented by Olympic engineer Charles McKimm was that in closed waters full ahead was restricted to 65 revolutions, half speed 55, and slow 35. Dead slow he said was about 20 to 25 revolutions. We obtain this by taken the ratio of the turbine horsepower (16,000 SHP) to the sum of turbine horsepower plus the indicated horsepower on both reciprocating engines (15,000 IHP each). Thus 16/(16+15+15) = 0.35. Slow-Ahead corresponding to 9 knots at 30 rpm is also confirmed from the testimony of Olympic’s Chief Engineer Robert Fleming. On modern Amphibious Assault warships of 40,000-tons displacement, such as the Tarawa class of the US Navy, Ahead One-Third is listed at 5 knots, Ahead Two-Thirds is listed at 10 knots, Ahead Standard is listed at 15 knots, Ahead Full is listed at 20 knots, and Ahead Flank is listed at 24 knots. So about 6 knots through the water for Dead Slow Ahead on these Olympic class vessels does not seem to be at all unreasonable for the slowest ahead speed that would be called for. Edward L. Attwood, Theoretical Naval Architecture, Longmans, Green & Co., 1922. There was no separate control of the revolutions on the turbine engine. The revolutions on the turbine depended only on the amount of exhaust steam fed to it from the reciprocating engines, which depended on the revolutions per minute carried by those engines. The term “knot” was still extensively used in 1912 to indicate both distance and speed. Even in log books you may see a column marked “Knots Run” to mean nautical miles traveled, and another column may be marked as “Av. Speed in Knots” to mean the average speed in nautical miles per hour. You would also sometimes hear the term “knots per hour” used to mean nautical miles per hour. Today, the term “knot” has only one meaning, nautical miles per hour, a measure of speed. It is even possible to come up with a negative percentage for slip if the distance made good was greater than the distance by engines. For example, for the passage from Ambrose lightvessel to Cherbourg for Aquitania’s voyage No. 320 eastbound, it was noted in the engineering log book that the crossing distance was 3239 miles, the mean distance by propellers was 3205 miles, and the average slip was listed as negative 1.0%.